"Milan is that way, Robbie. Thanks for all the, uh, hard work." 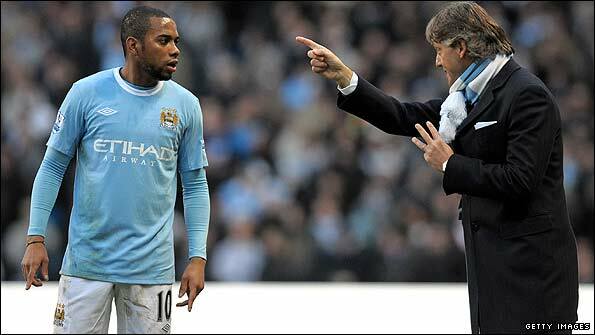 Robinho’s arrival two years ago almost to the day was a statement of intent from City’s brand-new ownership. It retrospect, it stands out from all the subsequent buys of the Sheikh Mansour Era at Eastlands because of a) its rashness; and b) its ultimate failure. While the Brazlian didn’t show the mettle expected of a Premier League player by disappearing in the winter, in away matches, and often times in less glamorous fixtures, his first season in sky blue wasn’t quite the flop many would have you believe. He did score 14 Premier League goals that season, ranking behind only Nicolas Anelka, Cristiano Ronaldo, and Steven Gerrard. Perhaps that negativity weighed him down, because all the talk of him as a failure seemed to become a self-fulfilling prophecy last season, when he turned in a number of uninspired performances before being shipped back to Brazil in January. As he showed this summer in South Africa with Brazil, when he’s on his game, he can be electrifying. I had hoped that Robinho’s City career could be salvaged with his confidence boosted from his loan spell and good performances for The Seleção, but it wasn’t to be. He’ll try to resurrect his club career at AC Milan, where he signed a four-year deal today. There’s no definitive word on the transfer fee received by City. There are reports of an initial £18m payment from the Milanese club, and £22m is the rumored total price tag. If so, that’s decent business on City’s part, as they were never going to recoup their £32m outlay for him two years ago. While it’s disappointing the marriage wasn’t meant to be, there’s a lot of resentment toward the Brazilian amongst City fans, who feel he wasn’t willing to do the heavy lifting that was required at the time to raise the club’s profile. Perhaps he’ll be happier and put in a better effort in Milan. He’s their problem now.